Postage due stamps are also part of the postage stamp stock the postmaster at Fossil, Oregon can use. 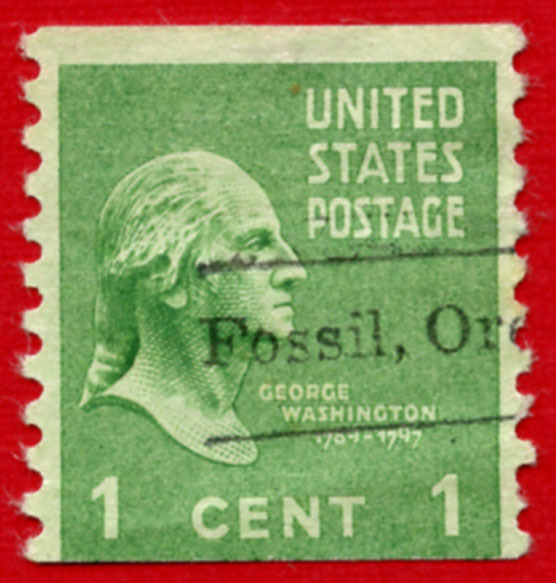 To reduce the time and effort of canceling stamps, the same precancel device as used on regular postage stamps (see the article on Fossil, Oregon precancel stamps) was used on postage due stamps. 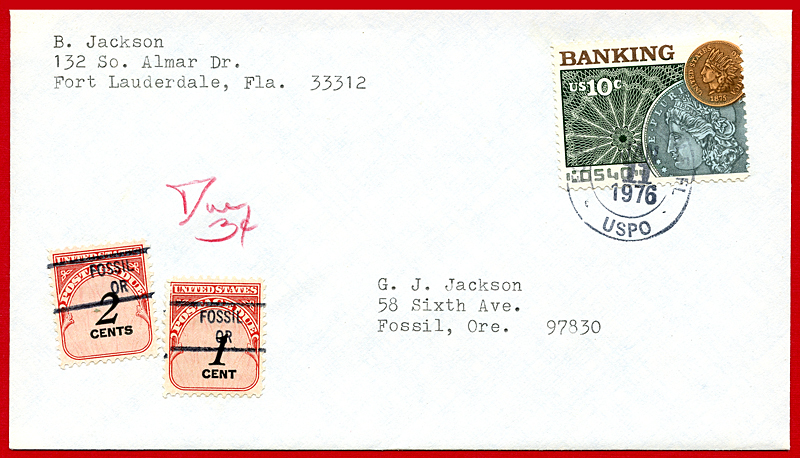 The first class surface letter rate increased from 10¢ to 13¢ on 31 December, 1975. 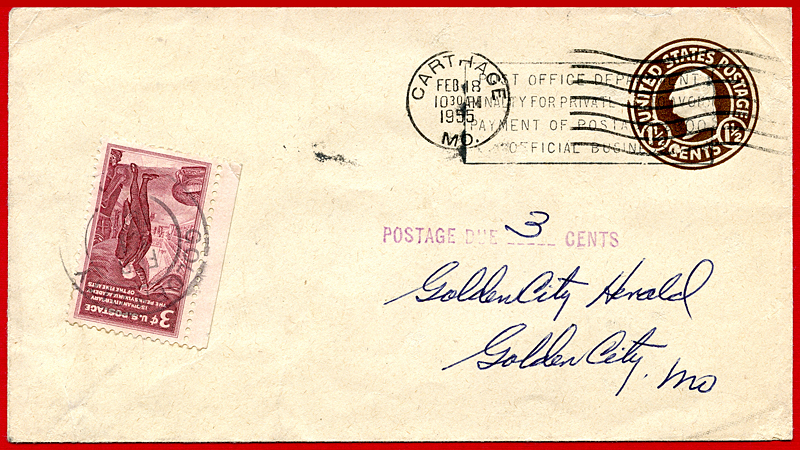 This cover is dated 11 January, 1976 and has a manuscript marking indicating three cents is the amount of postage still due. 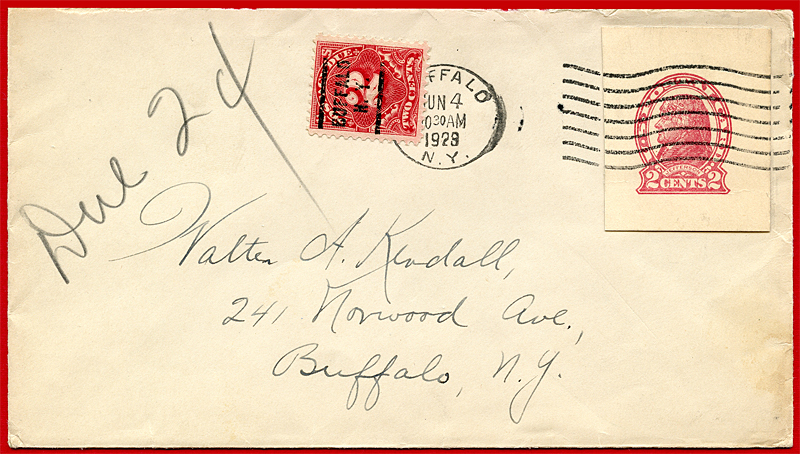 A total of three cents in postage due stamps was applied to conform to the new rate. The Owens-Illinois Glass Company of Toledo, Ohio utilized illustrated advertising indicia (slugs) in their postage meters from 1939 through 1941. The images depicted “The History of Glass” and sbowed various scenes of man discovering and making glass as well as using it for various purposes. For the collector of archaeological subjects, this is a gold mine as Phoenician and Egyptian cultures are both represented in addition to prehistoric man. The text in the first of the series reads “Primitive Man Discovers Nature’s Glass” and shows a club carrying prehistoric man looking at a piece of obsidian he’s holding. To my knowledge, this is the earliest image of a prehistoric human in philately. A favor imprint with a value of zero (.00) cents on meter tape of the National Postage Stamp Meter Company is shown above. The meter serial number is N.P.M. No 6131. These samples were often made available to the company’s prospective clients. They are NOT specimens as many collectors or dealers may have them labeled. An official specimen includes the text “Specimen”. The term ‘Perfin’ is a contraction of the words “perforated initials”. That’s a bit odd as it really doesn’t explain much about what that has to do with postage stamps. The official collector’s society for these types of stamps is The Perfins Club. Their definition is a simple one and much better stated than I can! Perfins are stamps that have been perforated with designs, initials, or numerals by private business and governmental agencies to discourage theft and misuse. The Sinclair (Oil) Refining Company also used perfins on its mail for exactly this purpose. 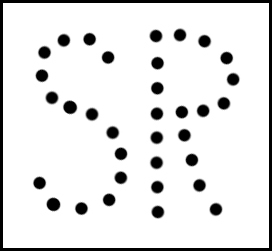 The illustration below, of the holes in the stamp forming letters, is representative of the recorded hole pattern used by the company. 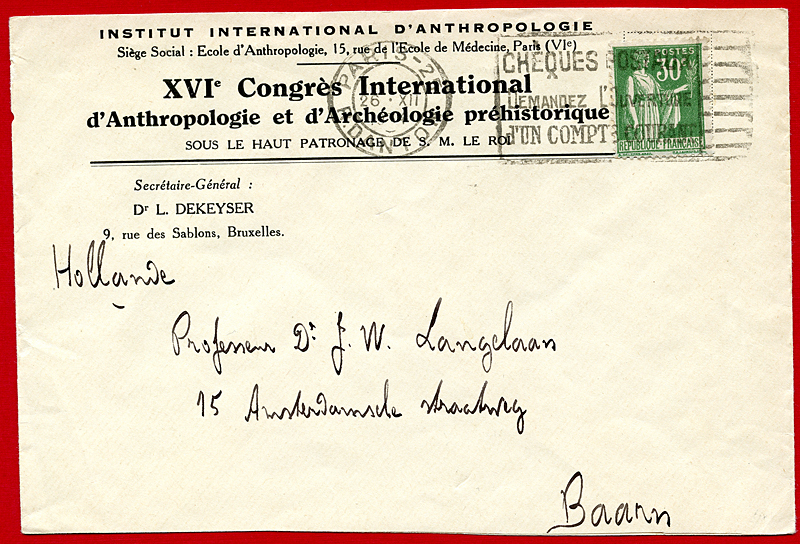 The following cover is an example of that use and it was mailed at the rate of 2 cents for domestic first class mail using a company perfin. 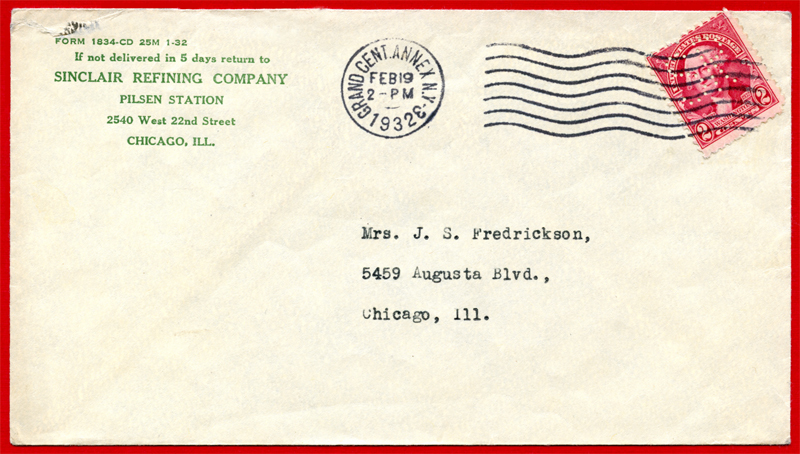 Although the corner card indicates a Chicago address, the machine cancellation device indicates the letter was mailed from Grand Central (station postal) Annex 3 in New York on 19 February, 1932. As it’s addressed to a Mrs. J.S. Fredrickson, I assume it was most likely a note home to Mr. Fredrickson’s spouse while he was in New York. As the content is no longer with the cover, my suspicion is that this is a private use of company assets (envelope and stamp) to a family member and not an authorized company business communication. If so, it’s a prime example of what the company was attempting to avoid. Many cities have names which are or include references to paleontology based on the local terrain or history of the area. Naturally, post offices within these cities carry their names in hand or machine postmarks, precancels, etc. and these are quite collectible. One problem is finding examples but the greater problem is in knowing which names to look for. I’ve been asked which ones I know of, so the following list of names is what I’ve found to date, excluding names of scientists. This list may be of some assistance to you when you’re looking through stocks. I’d be pleased to add to this list should you know of any further examples.